During the 2011 holiday season, a nationwide phenomenon began when individuals started paying off the remaining balance on in-store layaway orders for someone in their community, including at Toys"R"Uslocations across the country. Taking inspiration from these stories, the company has pledged to pay it forward by Giving Back each time a generous benefactor visits one of its stores and pays off the balance of the layaway order for someone in their community. For each layaway balance paid off as an act of kindness, the company will donate $200 worth of toys – the approximate average value of a layaway order created at Toys"R"Us – to the MarineToys for Tots Foundation, up to $1 million worth of toys. In addition, Toys"R"Us will challenge its Facebook fans at Facebook.com/Toysrus and Twitter followers @ToysRUs to join in Giving Back, from simply liking and retweeting posts to spread awareness for Giving Back, to sharing their acts of goodwill socially to inspire others to pay it forward. Each time someone pays off the balance of a layaway order at Toys"R"Us for someone in their community, the company will update a "Give Back Tracker" on Facebook. 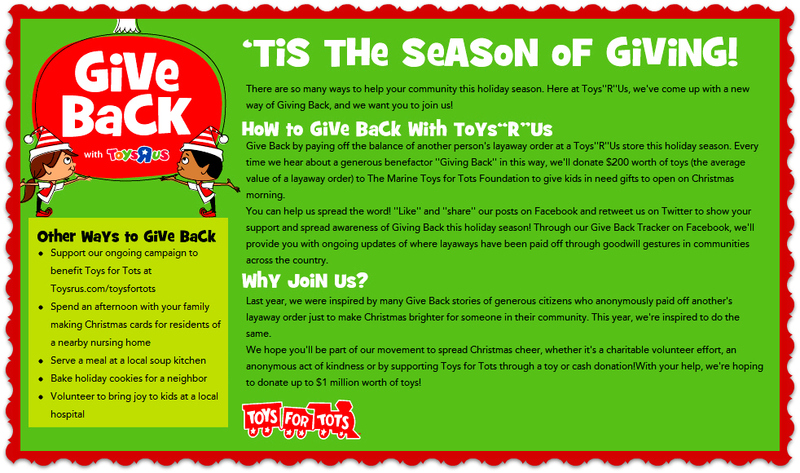 The "Give Back Tracker" is a map used to show where the layaway payoff took place, as well as the total amount of toys Toys"R"Us has donated to Toys for Tots as a result of this act of generosity. 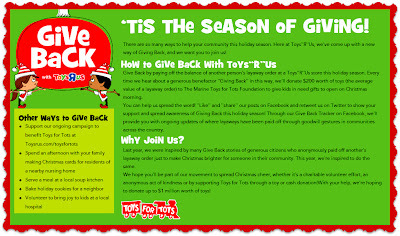 For more information on this Give Back program, as well as additional ideas for ways to give back, customers can visit Toysrus.com/GiveBack. Additionally, Twitter users can join the conversation with #GiveBack.